Piezo-pickup equipped instruments have unique requirements when it comes to DI boxes, and this product is designed to get the best out of them. 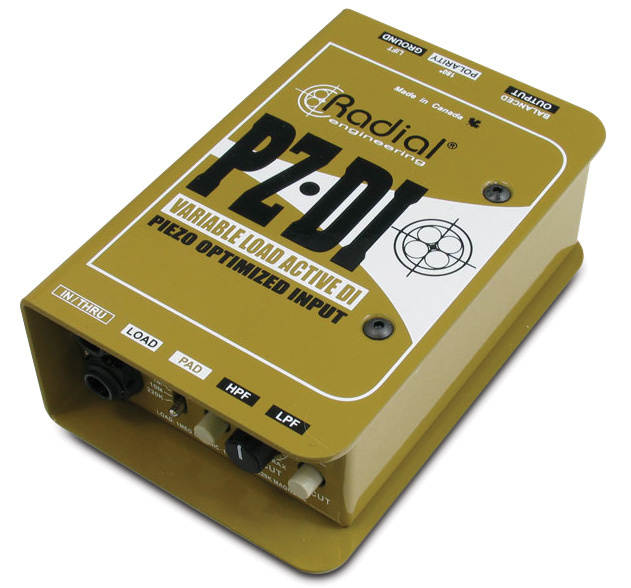 In 2002, Radial Engineering began building a stellar reputation in the active DI market with their phantom-powered J48 DI box. Since then, Radial have developed six variations of the J48, the latest being the PZ DI, which they describe as a variable-load active DI for orchestral instruments. This shares the common book-like form factor of its siblings, with an overlapping metal cover protecting protruding parts. In addition to the ground-lift, polarity-invert and pad switches that you'd expect to find at this price point, the PZ DI carries the unique combination of a three-position input-impedance selector, a rotary Lo Cut control for the variable high-pass filter, and a Hi Cut push switch that brings in a low-pass filter that gives a gentle roll-off above 3kHz. The impedance can be switched between 220kΩ, 1MΩ and 10MΩ. Radial feel that for magnetic pickups 220kΩ on a solid-state buffer stage gives a feel and sound similar to the 1MΩ found on most valve amps. The 1MΩ setting is found on many DI boxes, as this high-impedance load allows magnetic pickups to deliver a flatter high-frequency response than at lower loadings. The 10MΩ position is intended for piezo-based pickups that, in general, need to see impedances of this level to give a linear frequency response and to avoid the dreaded piezo 'quack'. The pad switch not only reduces the input sensitivity by 15dB, but also drops the input impedance to 50kΩ, reducing susceptibility to noise and also matching the PZ DI to buffered devices, such as active bass and guitar circuitry, digital keyboards and drum machines. The Lo Cut and Hi Cut filters are designed to tailor the sound of any piezo-equipped acoustic instrument. The variable Lo Cut allows you to progressively remove bass frequencies, whilst the switchable Hi Cut acts more as a gentle roll-off that can help smooth out the response of an overly bright source. Having unearthed a varied selection of acoustic pickups and with the PZ DI feeding a console, DAW and monitors, I worked my way through the input impedances. The 220kΩ setting produced quite an authentic tonality with electric bass and guitar. 1MΩ gave those instruments the expected, somewhat brighter sound that could be useful on a dark-sounding guitar or bass. That input impedance also worked extremely well when fed directly with my magnetic Sunrise acoustic guitar pickup and K&K piezo transducers, both of which are designed to drive into 1MΩ input impedances. The 10MΩ input impedance will cover piezo pickups from the majority of manufacturers and, unless you use K&K pickups or similar, this will probably be the setting you use the most. I auditioned various under-saddle, bridge-plate and stick-on pickups from Fishman, Lloyd Baggs, Barcus-Berry, Ashworth and Artec, and the PZ DI clearly revealed the differing responses and characteristics of both the pickups and the instruments. Engaging the pad and driving the PZ DI with dedicated onboard and external piezo preamplifiers was a similarly satisfying experience. The PZ DI's killer features, though, are the Hi Cut and Lo Cut filters. If you use piezo pickups on acoustic instruments, you'll be used to taking bass and low-mid frequencies out via EQ, either to reduce susceptibility to feedback or to remove frequencies that aren't being produced by the instrument. The PZ DI Lo Cut function is a more elegant way of achieving this; it produces a precise, progressive, LF attenuation that removes the need for more complex solutions. Pairing the Lo Cut with the gentler Hi Cut roll-off turned out to be the ideal answer to the challenges of one particularly peaky-sounding violin. Even if you already use piezo preamps in the studio or on stage, these filters will make your life much easier. Although I'm a bit bemused by its positioning as an "orchestral instrument” DI box, the PZ DI is one of the best-sounding, most practically useful DI boxes for piezo pickups that I've tried. Whilst there are other high-quality active DI boxes with 10MΩ input impedances around (my own Countryman Type 85s being prime examples) I don't know of any that are fitted with high- and low-pass filters — and for me, it's these filters that make the PZ DI not only a more than credible alternative to dedicated piezo preamps, but also a no-brainer for engineers and musicians who need its level of performance. The Radial Engineering PZ DI might be a bit pricey, but it's worth every penny.